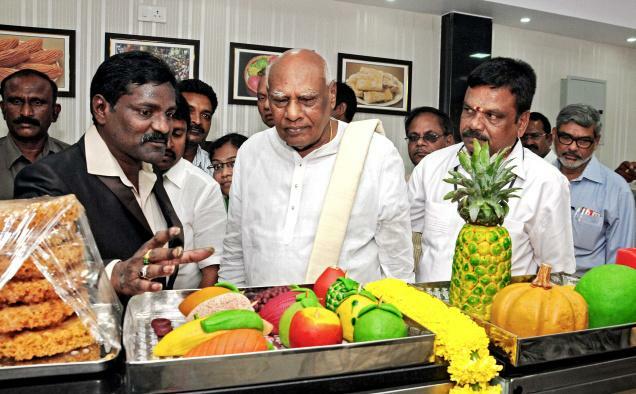 Tamil Nadu Governor K. Rosaiah has inaugurated Sri Bhakta Anjaneya Sweets, also known as Tapeswaram Sweets, on Eluru Road in Vijayawada. TN Governor has participated in the puja and blessed the organisers. Bhakta Anjaneya Sweets is known for its big laddos for Vinayaka Chaviti. Recently also, they have sent a big world record laddo to Vijayawada ganesh. Taj Gateway Chairman Mallineni Rajaiah, Tapeswaram Sweets owner Saladi Venkateswara Rao, former MLA Vellampalli Srinivas and others were present.